Publisher: Remains, historical & literary, connected with the palatine counties of Lancaster and Chester. Pub. by the Chetham society. vol. LXXIV, Remains, historical and literary, connected with the palatine counties of Lancaster and Chester -- vol. 74..
"Remains, historical & literary, connected with the palatine counties of Lancaster and Chester. Pub. by the Chetham society. vol. 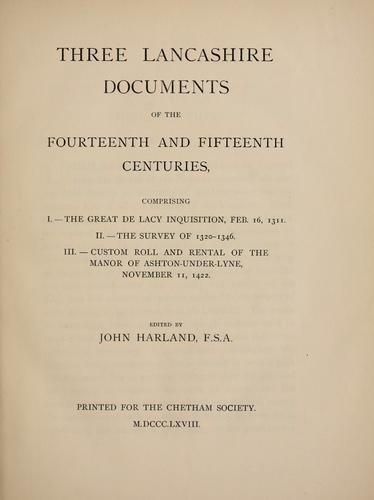 LXXIV, Remains, historical and literary, connected with the palatine counties of Lancaster and Chester -- vol. 74." serie. The More e-Books service executes searching for the e-book "Three Lancashire documents of the fourteenth and fifteenth centuries" to provide you with the opportunity to download it for free. Click the appropriate button to start searching the book to get it in the format you are interested in.